Especially characteristic of rich deciduous and beech-maple-hemlock forests, including forested dunes; also in rocky open forests, mixed forests, and under conifers such as cedar, pine, or hemlock, particularly in moist ground. The perigynia tend to be more strongly nerved in this species than in C. debilis. Occasionally the lowermost sheaths are minutely hispidulous or at least roughened, but not pubescent as in C. castanea. 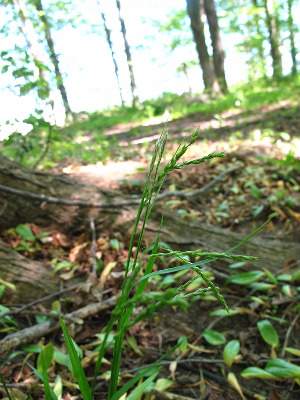 Occasional specimens from northern Michigan with the slender long spikes of C. arctata and sheaths nearly as pubescent as in C. castanea are presumably a hybrid of the two, named C. ×knieskernii Dewey. Carex arctata appears to hybridize occasionally with other species as well. MICHIGAN FLORA ONLINE. A. A. Reznicek, E. G. Voss, & B. S. Walters. February 2011. University of Michigan. Web. 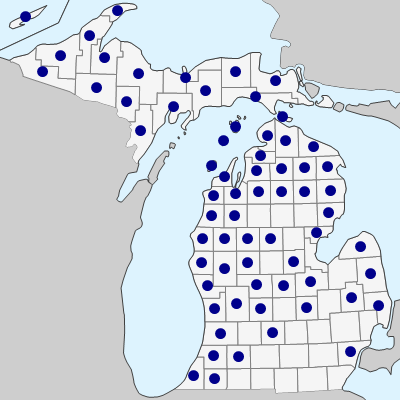 April 21, 2019. https://michiganflora.net/species.aspx?id=907.